WHERE DID P1.6b SAVINGS GO? : Bayan Muna has reported that Ombudsman Merceditas Gutierrez racked up P1.653 billion in savings representing unused allocation in her first four years in office and now asks, where did the amount go? Bayan Muna Representative Neri Javier Colmenares said that the Commission on Audit should review the finances of the Office of the Ombudsman to determine where the savings had been spent. He said that the accumulated savings of government agencies were "a source of corruption" for government officials who scrimp on their department's spending to be able to accrue savings and divert the funds for personal gains. CUSTOMS: EU AMBASSADORS CALL FOR MORE GOVERNMENT ACTION >>> Cleaning up the Bureau of Customs (BoC) remains one of the biggest concerns of European countries who want to trade with the Philippines. European Union (EU) ambassadors yesterday raised the concern even as they noted the technical capacity of the country's main ports during a tour of the Manila International Container Port (MICP)..."There are still some complaints from European companies about the transparency of fees charged to them," German Ambassador Christian-Ludwig Weber-Lortsch told BusinessWorld. "Speedy and clean transactions are still our priority," he added..."Transparent countries get privileged channels of trade,"...The concerns of EU members have already been brought up with the BoC, though, and the two organizations are cooperating to address them, Mr. Weber-Lortsch said. BoC officials, meanwhile, assured the delegation of 13 ambassadors that reforms were being implemented to address corruption in the agency. The bureau is automating its system to reduce face-to-face transactions, Customs Deputy Commissioner Horacio P. Suansing, Jr. said during the press conference. With less human intervention, there will be less opportunities for corruption. SANDIGANBAYAN CLEARS EX-GENERAL OF FAKING BIRTH DATE: The Sandiganbayan anti-graft court has cleared a retired general of charges that he had falsified his birth date on public records in order to be promoted and to extend his tour of duty. Maj. Gen. Ralph Flores, who has since retired, allegedly placed his birth date as March 30, 1949, instead of his supposed actual birth date of March 30, 1946, in nine documents that he had submitted to the Commission on Appointments. ...the Sandiganbayan...said the prosecution failed to establish the exact birth date of Flores. Two of the five justices who voted in the case dissented with the majority ruling, however...In his dissenting opinion, Associate Justice Alex Quiroz said that Flores was guilty of falsification because he was a public officer who made untruthful statements in public documents. In its decision, the court said...that there was no record of Flores birth. It rejected the prosecution's contention that Flores was really born in 1946, as evidenced by his finishing his elementary school studies in 1957. The prosecution had argued that if Flores was born in 1949 as he had claimed, it would mean he had entered Grade 1 when he was only two years old. The court also said the documents that Flores submitted to the Commission on Appointments...could not be considered public documents and their submission did not make them public records. BIDDERS OF GOVERNMENT CONTRACTS URGED TO SIGN "INTEGRITY PLEDGE": Bidders for government contracts will soon be required to sign the "Integrity Pledge," an anti-corruption campaign where companies commit not to engage in corrupt practices, in an effort to eliminate corruption in government. European Chamber of Commerce of the Philippines (EECP) vice-president for external affairs Henry Schumacher told a press conference that the ECCP has been meeting with various government agencies to enlist their support for the "Integrity Pledge" starting with the bidding of contracts. Schumacher, who was replaced by Michel Milado as ECCP executive vice president, said that at least 7 government agencies have committed to undertake their counterpart the business communitys "Integrity Pledge" list for their bidders. These agencies are Departments of Energy, Education, Public Works and Highways, the Bureau of Customs, Budget and Management, Transportation and Communication, and the Philippine Economic Zone Authority. Employees and incumbent executives of the Commission on Audit have apparently buried the hatchet with two new Aquino appointees who will take over the reins of the constitutional body. Newly appointed Chairperson Ma. Gracia Pulido-Tan and Commissioner Heidi Mendoza were warmly received by the CoA community when they heard Mass at its main office in Quezon City. COA officials and employees have previously aired misgivings over the controversy-laden entry of the two fresh members of the commission. The objection against Pulido-Tan, who vowed transparency and openness as twin main policies she will push, was centered on her being an “outsider”. The Philippine Government Audit Service Employees Association (PHILGASEA) has withdrawn its objection against Tan but appealed to the president to "pick among CoA officials” when he appoints new officials next time. On the other hand, Mendoza apologized to those who were hurt by pronouncements aired in the Senate hearings in connection with alleged corruption in the Commission. Mendoza, the whistleblower in the AFP fund scam, was previously a state auditor who resigned in disgust over alleged refusal of her seniors to support her findings on alleged anomalies in the handling of military funds. Pulido-Tan and Mendoza are set to formally start with their new jobs on Monday, with the former vowing to start work by meeting Commissioners Juanito Espino Jr. and Mendoza to start discussing their plan of action. “Overstaying auditors ang lumulutang na priority. Matagal na tinitingnan natin iyong napakadaming conflict sa area na ito,” said Pulido Tan when asked what her priority concern would be. Pulido-Tan said she has gathered than a number of auditors have remained in their post for over the usual three year tour of duty. Referring to graft and malversation cases filed before the Sandiganbayan, Pulido-Tan said a mechanism for the review of audit recommendations and follow up of their proposed action to government agencies will also form part of the priority. The former finance undersecretary stressed that while many graft charges are based on audit findings made by CoA, the filing of charges and implementation of administration action is vested on the concerned agency. Asked if she received any “marching orders” from Aquino, the new CoA chief said she has yet to meet Aquino since the president surprised her by announcing her appointment to the state audit agency. “It’s a good thing we didn’t (meet). CoA does not take marching orders from anyone,” Pulido-Tan said as she stressed that the agency is an independent constitutional body. MIKEY ARROYO COMMITTED FRAUD TO PURCHASE BEACH HOUSE IN US? : While Ang Galing Party-list Rep. Juan Miguel "Mikey" Arroyo insists there is nothing wrong in the sale of his alleged beachfront house in California, he should be posed a question as to how it landed on his lap in the first place, a finance expert said. In an interview with ABS-CBN Northern America News Bureau, financial advisor James Triguero is wondering how Arroyo got his mortgage approved when he purchased the Foster City property in 2006. "He makes P455,000 a year. That would not even cover the property taxes on that property. How did they get a loan for $1 million? They would have to commit mortgaged fraud and claim that they had a $300,000 plus income in the United States, when of course he's functioning as a congressman in the Philippines to qualify," he explained. He stressed: "If you lie on a mortgage application like that, thats fraud." VERA Files reported on Monday that a company partly-owned by the former First Son sold the house for $1.125 million to owners of the restaurant chain "Gerrys Grill." VERA Files said Arroyo claimed 40% ownership of the real estate firm, Beachway LLC, but "visitors to the Foster City property were left without a doubt as to its occupants' identities." VERA Files obtained photos of Mikey and his family displayed on some furnitures in the house. In a separate interview, Arroyo said there is nothing wrong with the sale of the 5-bedroom house overlooking San Francisco Bay. He said it has been acquired by Beachway LLC, where he only has a minority stake. ABS-CBN found out that the former First Son actually got 2 mortgages that reached more than $1 million for the property, which was originally under the name of his wife Ma. Angela. Within 2 years, these were all paid off. It was after a year that it was sold to Beachway. Triguero, however, asked how they were able to bring in huge sums of money in the US without alarm bells going off..
COA UNCOVERS ANOMALIES IN OZAMIS TAX HANDLING: The Commission on Audit claims to have found "grave irregularities" in the financial transactions of the city government. But as far as Mayor Nova Princess Echaves is concerned her administration has not done anything unlawful. In a report submitted last week, Laura May Ozaraga, head of a special audit team formed by the COA office in Northern Mindanao, said the anomalies the team uncovered were the failure of the city government to remit P40 million in Real Property Tax and Community Tax Certificate collections to the city's 51 barangay (villages) from July to September 2010. IRREGULARITIES OF NBI AGENTS "FORCE" SUSPECT'S ESCAPE: A murder and robbery suspect said he bolted the National Bureau of Investigation jail last February because he could no longer stomach alleged irregularities perpetrated by his arresting officers. Albert Faye Mata...said he joined...in the escape to reveal alleged illegal manueverings done by his arresting officers to take his properties. The properties included a condominium unit, two vehicles, and a small franchise business. "They took all my properties. They deceived me and asked me to sign papers to sell all the properties which I owned," Mata told reporters. NBI agents reportedly escorted Mata out of his cell to withdraw money from his ATM account. He said the NBI agents had also threatened to kill his son. MANILA EX-MAYOR FACES PLUNDER CASE: The city government of Manila has filed a P4.5-billion plunder case against former Manila Mayor and former Environment Secretary Joselito "Lito" Atienza Jr. over the allegedly overpriced Pasig River dredging project. ARMED FORCES PROBING ANOTHER SENIOR OFFICIAL FOR IRREGULARITIES: The Armed Forces of the Philippines (AFP) said it is investigating another senior official after finding out irregularities in the military's consumption of petroleum, oil and lubricants, which reached almost half a billion in just one quarter. In a press briefing, AFP spokesman Brig. Gen. Jose Mabanta said the probe against AFP deputy chief of staff for logistics Commodore Teddy Pan was ordered by current chief Gen. Eduardo Oban himself. Former AFP chief Gen. Ricardo David supposedly informed Oban of the anomaly during the turnover ceremony last March 7. "He (David) was not knowledgeable until the latter part (of his tenure) and he was the one who initiated the conduct of the investigation," said Mabanta. David and Pan are both members of the Philippine Military Academy class of 1997. Pan, who is set to retire on July 17, supposedly reported a P400 million-worth consumption of petroleum, oil and lubricants from January to March 15, way above the authorized P150 million for every quarter. The incident is fueling suspicions that the military is still resorting to an illegal conversion scheme to generate funds for the going-away gift of David, who declared earlier he had not received any. "There is now an ongoing investigation. Initial investigation apparently states that there seems to be no discrepancy, there seems to be no malpractices. However, it is still too early and we will be informing you of the developments as we move on," Mabanta said...He said the move is part of Oban's promise to rid the military of corruption. IN THE GUARDIAN (UK): "Corruption is embedded in the Philippines. It has been estimated that 20% to 30% of public expenditure goes astray. But the work of challenging this kind of fraud is dangerous. In some parts of the Philippines there is effectively a form of warlordism. So the country is a good place to test out what citizens armed with new technologies can do to challenge poor governance." PRESIDENT AQUINO: "FIGHT AGAINST CORRUPTION BEARING FRUIT" >>> The administration's fight to weed corrupt officials out of the bureaucracy is already bearing fruit, notably with the likely impeachment of Ombudsman Merceditas Gutierrez, President Aquino said yesterday. "We have succeeded (in the impeachment) at the House, and sending the articles of impeachment for trial at the Senate. In about a month's time (an impeachment trial will start). So, the change that we're pursuing can be achieved," Aquino said in an impromptu speech before students and faculty of St. Paul University in Ermita, Manila. "We now have a battle at the Ombudsman. Perhaps the case that we should pay most attention to is that of (retired military comptroller Carlos) Garcia," he said. The Commission on Audit (COA) has a new chairperson in Maria Gracia Pulido-Tan. Tan takes the helm of COA chair, taking over from Reynaldo Villar. With her experience as a lawyer in the private sector and as an accountant, Tan is well-suited for the top COA post, said Malacañang. A private lawyer by profession, Tan was not always enthralled by the prospect of serving in government. But when the late Presidential Commission on Good Government tapped her to serve in the agency, she didn't think twice. "It was very important to me that if I left my comfort zone, I wanted it to be with someone I admired and respected. I said yes," she said. Tan later served as Finance Undersecretary for Revenue Operations under the Arroyo administration. "I was there not to have a career in government. I was needed at that time," Tan revealed. When Secretary (Isidro) Camacho resigned, she said she would also resign with him, but decided to stay on to help Undersecretary Juanita Amatong who took over the post, before she eventually returned to private practice. Today, Tan said she intends to lead by example to ensure the agency remains above board. "When you say 'graft buster', we always start with ourselves," Tan said on ANC's "The Rundown" on Friday. "As head of the office, the buck stops with me. It's command responsibility. We have to police our own ranks so we can do the job we have been called upon to do the best way we can and in the most efficient and effective manner." Despite claims of irregularities among some COA officials, Tan said she believes there are dedicated public servants. She said she wants to get to know the commission's staff and will not hesitate to tap corrective measures if necessary. Tan subscribes to proper documentation, and rotating auditors to keep them from becoming overly familiar with the agency they're auditing. But Tan admitted it may not be easy to report discrepancies as there is still a need to balance this with the right to due process. "Are we going to be proactive in filing complaints? We have to look at that because we might be going beyond our mandate. On the other hand, when there's a complaint, we can't just dismiss it. We have to identify and authenticate the report. "I don't want to focus on it being a time of controversy for the COA, rather it's a time of coming out for the COA," she added. Tan said she welcomes the chance to work with celebrated whistle-blower and now COA commissioner Heidi Mendoza. Tan added that Mendoza's own efforts at fighting corruption in government, by baring what she knows about alleged corruption in the Armed Forces of the Philippines in Congressional hearings, has helped bring the commission's work to the forefront. 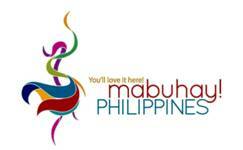 "It's going to be a commission of three: Heidi, me and Commissioner Juanito Espino Jr.," Tan said. "I'm not intimidated at all. I'm happy for her [that] people are taking notice. She brought the COA to the public consciousness, the nature of its work, and what the public can do to help. "I'm glad she's there. That's going to make my job easier at the COA. What's important for me is if we're getting the job done," Tan added. Tan will serve as COA chair until February 2, 2015. During her term, she hopes to bring the Commission closer to the public by tapping its media arm. She also wants to make Filipinos realize that they have a stake in making government officials accountable. "The COA was meant to give people a proper and full accounting of their money. "We will strengthen the COA. We will bring it closer to the people. We will engage the people to help us carry out our constitutional mandate," Tan said. In line with our theme of “MAPping a Culture of Integrity” and our goal this year to address Corruption, Criminality and Climate Change, we in the MANAGEMENT ASSOCIATION OF THE PHILIPPINES (MAP) highly commends the appointment of Ms. Heidi Mendoza as Commissioner of the Commission on Audit (COA). MAP commits to continue helping Ms. Mendoza for her crusade against corruption which continues to be one of the biggest impediments to economic growth and prosperity in the country, and it has been eroding the moral fiber of the nation. Corruption in public service is anti-poor and is blatantly opposed to the “Kung walang corrupt, walang mahirap” battlecry of President Benigno C. Aquino III. The public money that went to private pockets of greedy public officials and their families could have been used to fund programs for the poor on education, health care and housing. We encourage Congress to immediately enact the Freedom of Information Law which will give the access to information heretofore hidden from public scrutiny, and the protection for truth-tellers and whistle-blowers. AMPATUAN, STAFF USED SPURRIOUS RECEIPTS TO REIMBURSE P2.5b ARMM FUNDS: Detained former Autonomous Region in Muslim Mindanao (ARMM) Gov. Zaldy Ampatuan and at least 10 of his former staff used spurious receipts and invoices to support disbursements of some P2.559 billion of regional funds in 2008 and 2009, according to the Commission on Audit (COA). In its Special Audit report, COA reported that some transactions might be considered fictitious as these were supported with spurious receipts and invoices. The audit covered the period of January 2008 to September 2009 and was conducted from Feb. 1 to Dec. 20, 2010. While funds were released to settle obligations of six line agencies of the ARMM, COA said officials of the Office of the Regional Governor, whose signatures appeared to have been scanned by a computer, signed all documents supporting payments. "There were no documents to prove that the goods and services were received by the concerned six line agencies," COA reported. DOJ WON'T LET BIR HANDLE TAX CASES: The Department of Justice (DoJ) is objecting to several bills filed in the House of Representatives that seek to give lawyers of the Bureau of Internal Revenue (BIR) the exclusive mandate to investigate, handle and prosecute tax-related cases. In a position paper submitted to the House committee on ways and means chaired by Batangas Representative Hermilando Mandanas, Justice Secretary Leila de Lima said that tax cases fell within the jurisdiction and competence of the DoJ's National Prosecution Service (NPS). COURT ORDERS IMELDA TO PAY BACK P12m TAKEN FROM NFA: The Sandiganbayan's fifth division has ordered former first lady Imelda Marcos to pay back the government P12 million illegally taken from the National Food Authority (NFA). A two-page writ of execution was issued against the widow of the late dictator Ferdinand Marcos last week to be implemented by Sandiganbayan Sheriff Edgardo Urieta. SOLON: SENATE SHOULD CALL EX-FIRST COUPLE >>> Former President and now Pampanga Representative Gloria Macapagal-Arroyo, her husband and her former Cabinet officials should be compelled to take the witness stand in the impeachment trial of Ombudsman Merceditas Gutierrez in the Senate, Rep. Walden Bello said. Bello, representing the party-list group Akbayan, said getting major players like Arroyo to testify would boost the chances of convicting Gutierrez. Bello noted that Arroyo and her Cabinet were able to evade previous investigations such as the one on the fertilizer fund scam and NBN-ZTE deal when Arroyo was in office. EX-DPWH EXEC BEATS GRAFT RAP: Former Department of Public Works and Highways (DPWH) Undersecretary Salvador Pleyto is on a winning streak in his fight against the graft cases filed against him. After reversing an Ombudsman decision dismissing Pleyto from the government service for unexplained wealth in 2007, the Supreme Court this year found him guilty only of negligence for failing to disclose his wife's business interests in his Statement of Assets, Liabilities and Net Worth (SALN) for the years 1999 to 2001. GUTIERREZ SHOULD GET CREDIT FOR RETURN OF LIGOT FUNDS: Embattled Ombudsman Merceditas Gutierrez should also get credit for the Philippine government's receipt of $132,000 in proceeds from the sale of a forfeited California property owned by the wife of former military comptroller Jacinto Ligot. According to Assistant Ombudsman Jose de Jesus, it was Gutierrez who initiated the request in 2009 for the money equivalent to about P5.7 million to be turned over to the Philippine government. Stradcom Corporation files criminal charges against Assistant Secretary, chief of Land Transportation Office, for allegedly withholding over P1 billion in overdue payments since October 2010. "Merci's trial should not drag until her retirement"
SENATOR: Calling Arroyo to Ombudsman impeach trial "counterproductive"
OMBUDSMAN reveals that only nine of 39 government agencies given reminders for unliquidated cash advances posted 100 percent rate of reduction after the reminder. Malacañang is studying whether or not to pursue the administrative cases filed before it against Deputy Ombudsman for Luzon Mark Jalandoni following his resignation last week. Chief Justice Renato C. Corona rallied the country’s more than 40,000 lawyers to prevent corruption from establishing its roots in the legal community. “Educating our own ranks on the evil of corruption and recognizing those who personify the values of honesty and competence will strengthen the moral fiber of our profession and our nation as a whole,” Corona said. The values of integrity and competence, he said, were the ideals that pushed the Supreme Court to integrate the members of the law profession into a national body. “Sadly, however, the years have hardened some of us in heart and in mind. Certain realities in legal practice can sometimes instill harsh and painful lessons and can even make it difficult to stay true to our oath as lawyers,” he lamented. “Let us therefore go back in time and remind ourselves again of how we felt when we first stood before the justices of the Supreme Court years ago to recite that time-honored oath. All we need to do is to believe in ourselves and our God-given ability to live up to the greatness and nobility of our chosen profession,” he said. A comparison with another such institution in a very similar neighbouring country – the Office of the Ombudsman of the Philippines – illustrates the KPK’s success especially in investigating and prosecuting corrupt public officials. 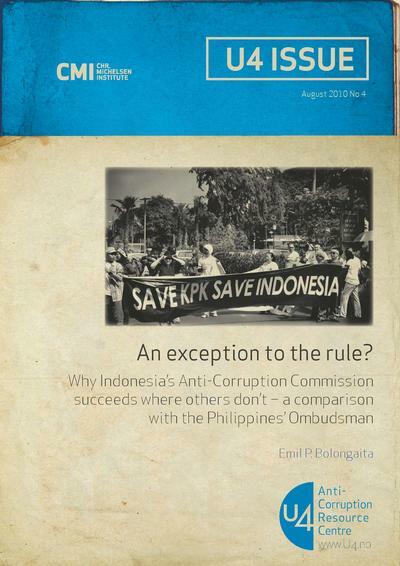 Why was the KPK, in just five years, able to reach a 100% conviction rate against top officials in all major branches of the Indonesian government, while the Philippine Ombudsman has scored only few convictions in its 20-year history? Part of this success can be explained by considerable investigative powers given to KPK, which the Philippine Ombudsman does not hold. Also, rigorous pre-testing of every prosecution and a highly efficient anti-corruption court contribute to KPK’s success. These and other factors are analysed in this U4 Issue, which concludes with recommendations for donors and governments on the establishment and strengthening of anti-corruption agencies.